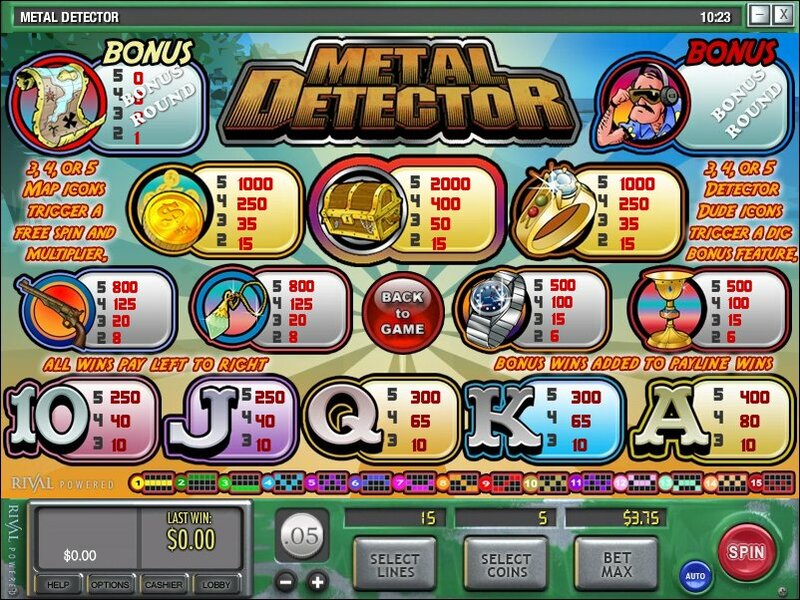 Overview: Metal Detector is a 5 reel, 15 payline Slot machine. Metal Detector has 2 Scatter Icons. The Map Icon is a Scatter Icon. If 3 of these icons appear on the Reels you will be sent to the Treasure Map Bonus Round. These symbols do not need to appear in a sequence to trigger the bonus round as well you do not need to be playing all Paylines. It can be anywhere on any of the five reels. The Man Icon is a Scatter Icon. If 3 of these icons appear on the Reels you will be sent to the Dig Bonus Round. These symbols do not need to appear in a sequence to trigger the bonus round as well you do not need to be playing all Paylines. It can be anywhere on any of the five reels. 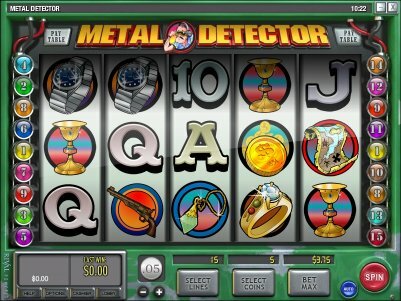 Similar Slots: If you like Metal Detector, you might like these other Rival video slot machines: 5 Reel Circus, Doo-Wop Daddy-O, Fast Lane, Gushers Gold, Wacky Wedding.